"They had nothing in common until love gave them everything to lose Louisa Clark is an ordinary girl living an exceedingly ordinary life--steady boyfriend, close family--who has never been farther afield than their tiny village. She takes a badly needed job working for ex-Master of the Universe Will Traynor, who is wheelchair bound after a motorcycle accident. Will has always lived a huge life--big deals, extreme sports, worldwide travel--and now he's pretty sure he cannot live the way he is. Will is acerbic, moody, bossy--but Lou refuses to treat him with kid gloves, and soon his happiness means more to her than she expected. When she learns that Will has shocking plans of his own, she sets out to show him that life is still worth living. 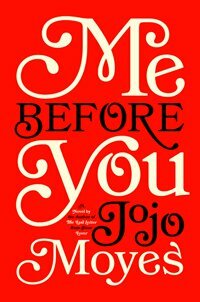 A Love Story for this generation, Me Before You brings to life two people who couldn't have less in common--a heartbreakingly romantic novel that asks, What do you do when making the person you love happy also means breaking your own heart? " -- Provided by publisher. wonderful. the kind of book you can't put down and you don't want to end. submitted by 21621031390949 on March 27, 2013, 9:45am I'm not sure how I knew about this book -- perhaps the NYTimes book review -- but when I was notified that it was on hold for me, I almost didn't check it out. The cover looked like a lightweight love story, the kind I don't normally read. I'm so glad I did read it. Yes, it is a love story, and often the tone is light, but it is an excellent read, one that made me curl up in a corner and tell everyone to leave me alone until I finished it. Moyes is not a glorious or cerebral writer; however, she is a great storyteller. She creates and colors in her characters well. The main characters were interesting and ultimately fully dimensional. You come to care about them deeply. Mostly, the story is told well, building subtle sub-themes and propelling toward the finish. The only odd part of its form were the few chapters sprinkled throughout the book that were told from a different character's point of view. It was interesting in that it provided more depth and perspective, but it was disconcerting and a bit confusing. I also had some trouble matches chronological details, such as figuring out which sister was older, and what happened when in the past. However, my interest in the story was such that I didn't want to take the time to review for these answers. I could easily overlook my questions and move on with the plot. Overall, a lovely beach-side novel, with more depth and complex issues than most. A little bit of triteness, but that is easily compensated for by the interesting characters and well-developed pacing of the story. Enjoy! Loved this book! submitted by bookher on January 21, 2014, 9:14am Just read it! You won't be able to put it down. Very sweet story that addresses real issues. Tearjerker submitted by Lucy S on July 28, 2014, 6:44pm A really moving love story. Impossible to put down! Bring the tissues submitted by sueij on July 2, 2015, 10:31am Fast and breezy, but bring a box of tissues. To give away a little but not too much, this is the story of a woman who takes a care taking job for a man with quadriplegia. She doesn't know when she takes the job that he plans, at the end of six months, to go to a "death with dignity" facility and end his life. I thought the characters were interesting. The storytelling is almost entirely first person by the caretaker, with three or four individual chapters by other close characters. Those were very well timed and well done to add depth and perspective. The crux of the story is the relationship between Louisa and Will, and it develops in natural and interesting ways. I did think she was occasionally ridiculously naive, though. I couldn't decide if that was reasonable for her/ inherent to her character, or a bit too much and a tool of the author. It sparked interesting book club discussion! Must Read submitted by 1robbies on June 17, 2016, 2:46pm Achingly heartbreaking, yet a wonderful, inspirational read. Moving book I couldn't put down submitted by boilerfan42 on June 20, 2016, 12:53pm When they say bring tissues, they are not kidding. This book came to my attention when I saw a trailer for the movie. It looked so good I had to find the book and read it before the movie came out. Once I started, I couldn't stop. Finished on a road trip and bawled the whole first leg of trip. The story was very good and had an interesting, heartbreaking twist that I did not see coming. Easy read and highly recommended before or instead of seeing the movie. Movies are never as good as book. Amazing submitted by purplelily on June 20, 2016, 7:43pm One of my favorite books! It made me cry and laugh at the same time. I highly recommend it to all. The movie was a plus too! So glad I read it submitted by Zekicmom on August 27, 2016, 9:52am I could not put this book down. I don't remember when I read a book so quickly. I can tell I'm going to be rather emotional for a while, but it was worth it. Now I have to decide if I want to see the movie or not, what if it doesn't do the book justice! New York : Pamela Dorman Books, 2012. Home health aides -- Fiction.